I adhere to the rule that the more expensive product is with a better quality and the high price now will be paid to you many times in the future. But I can say there are a lot of flat iron that are not so expensive but they do awesome work. This is the case of Infiniti Pro by Conair Professional 1-1/2 Inch Tourmaline Ceramic Flat Iron, it’s not an expensive flat iron but it works very well on my hair. I have really curly hair but I can say this product is doing brilliantly. One of the best thing for this hair straightener is that it comes in three different sizes: 1, 1.5 and 2 inch. You have the opportunity to choose which size is better for you depending on what you want to do with your hair.One more thing – each of the different sizes is available in a different color. I think the best for my hair type is the 1 or 1.5 inch options because in this way I can use it for curling and straightening at the same time. The temperature of this flat iron is really high, it can get up to 446 degrees. This is suprising fot that price. And in addition we have the tourmaline plates that keep the temperature all the time, and the properties of the mineral protect the hair from heat and make the hair shiny. Not bad, it sounds like a super iron, isn’t it? We all appreciate our time, especially in the morning. Yes, that moment you run from the mirror to the closet, realizing that you will be late for work. 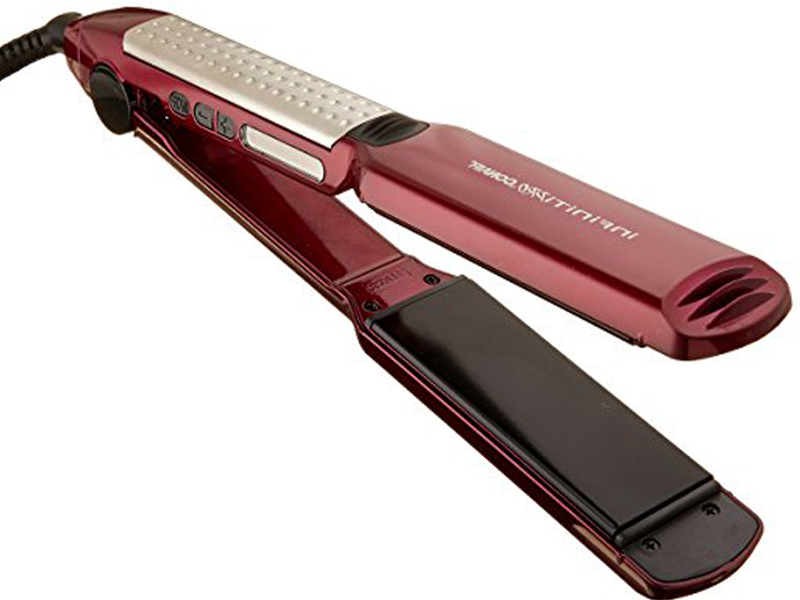 Then you appreciate how amazing it is that at least the flat iron does not give you up and can heat up for 20 seconds, like Infiniti Pro by Conair Professional 1-1/2 Inch Tourmaline Ceramic Flat Iron. This flat iron comes with a heat shield that can be put on once the iron is no longer in use, and it will protect countertops from heat while the iron is still cooling down. For my other flat irons I use pads that strive to be of materials that are not supplied to heat. This gives me the certainty that I will not set anything on fire. But with this model they have predicted this and included this wonderful addition to the product. The floating plates on the Infiniti Pro should make it easier for users to straighten their hair because the non-fixed plates are slightly more flexible and able to grip hair more. The only problem is that sometimes the floating plates grab hair too and until you feel the straightening becomes a painful experience. It is not only with Infiniti Pro, it’s the same about a lot of flat irons with this feature. I think the floating plates make the work with a flat iron easier, but painful in some cases. 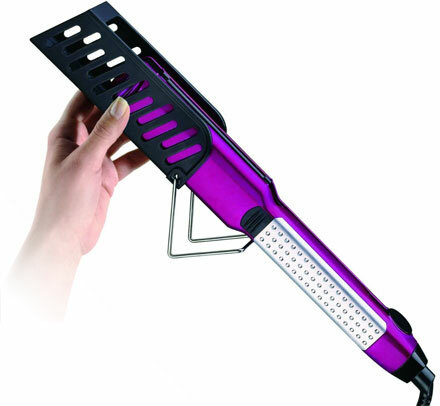 You have to be sure that using this flat iron with its high temperature won’t demage your hair. 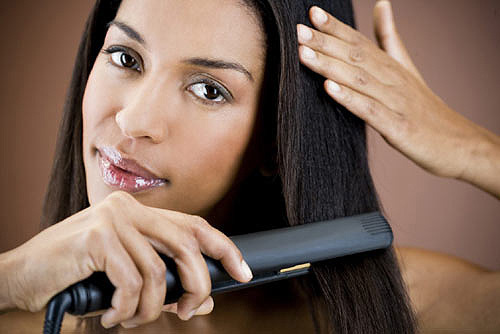 If you have a sensitive hair may be you should looking for another model which reaches lower temperature. I like Infiniti Pro because my hair is accustomed to treatment with flat irons and high temperatures and it does not affect it so dramatically. As a conclusion we have to say that the price is very good, it’s under $40. May be it’s not a flat iron you are going to use every day, but it’s perfect for the time you are on a trip. In addition to the good price, you can choose size and color and take advantage of high temperature and tourmaline plates.